AmazonBasics Ladder Toss Set is hands-off the best on the market. A set comprising all you need to play straight out of the box, kid-friendly, as well as durable. It’s build to offer interactive family fun and is designed for two to four players. It’s suitable for ages 14 and up, although younger users can also play as long as they understand the risks and the meaning of appropriate behavior. The trait we like best is the simple set up. This set comes with two frameworks of 40×24 inches each. They are made of PVC pipes and are really easy to erect and dismantle. Besides the frameworks, you’ll get six bolas, three blue and three red. Another nice thing is the included carrying case for easy transport and storage. All are coming at a more than attractive price point. Easy to set up and break down, reliable, resistant, and suitable for outdoor and indoor play, this is one of the best ladder ball sets you could come across. Are you worried that your kids spend too much time in front of a screen instead of outside and interacting? Then buy them the Rally and Roar Ladder Toss Set. Boasting a premium design and coming at a price that won’t break the bank, this one delivers impressive value for money. 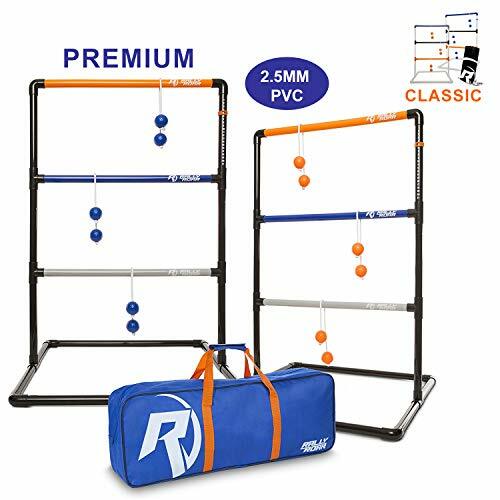 The ladders are made in tournament style from durable Virgin PVC tubing. Their sand-weighted bases improve stability on all terrains and in all weathers, while also ensuring they won’t fall apart when the bolas hit them. The bolas are also amazing. Made from resin, they provide ergonomic precision, are perfectly balanced and easy to toss. Thanks to the easy-to-follow instructions, this set is also simple to set up and breakdown. A premium heavy-duty carrying case also allows you to take the lawn game with you wherever you’re going. 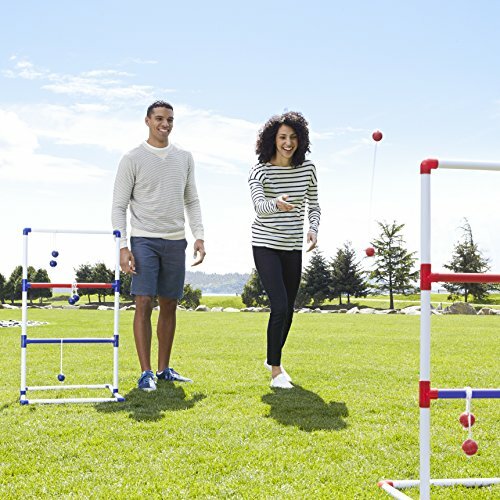 Perfect to enjoy by players of all ages; this fun game encourages athleticism and hand-eye coordination. Perfectly priced for its quality, it’s a valid alternative to our best choice above. If you’re an avid amateur or a beginner professional player, the wooden ladder golf tournament edition could be the right one for you. 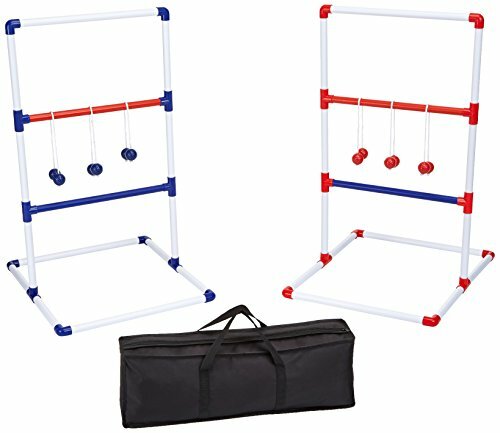 This ladder golf set is sanctioned for official tournaments. It’s made of high-quality materials, including wooden frames for a longer lifespan. These frames also bring elegance, enhancing the sophisticated spirit of this game. Two sets of bolas, one white and one green, increase the set’s versatility. They have the aspect and heft of real golf balls and are tied with a strong rope that allows you to play without worries. Another nice thing is the included carrying bag. This zipper duffle-style tote is roomy enough to accommodate both ladders and all accessories, providing the perfect transport and storage solution. 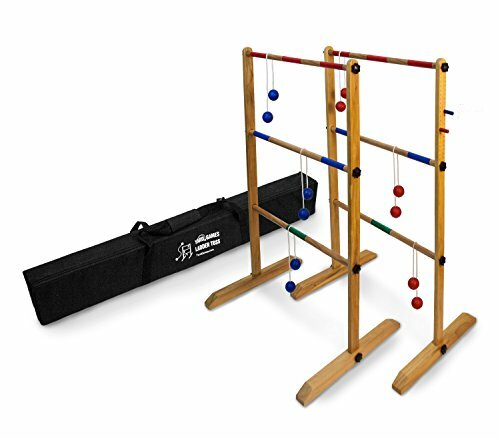 Backed by a 1-year quality guarantee on the part, this wooden ladder ball set is perfect for those who’re serious about their game and don’t mind spending a tad more on equipment. 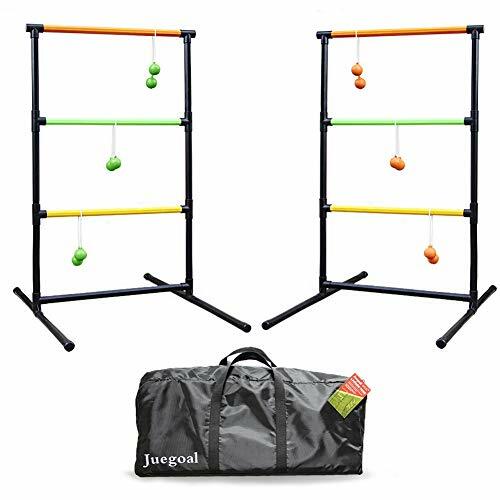 A nice alternative to all other ladder ball sets on this list, the Metal Ladder Toss Games Set by GoSports Premium is a complete backyard fun solution comprising two steel targets, six bolas, and a premium carrying case. Undoubtedly, the steel frames are the main feature of this set. All metal components are powder-coated to resist harsh weather and elements and are constructed to withstand the test of time. We also liked the soft rubber bolas included in this set. They give you the possibility to play either indoors or outdoors, making this set ideal for all seasons. It is also ideal for players of all ages, including kids and teens. 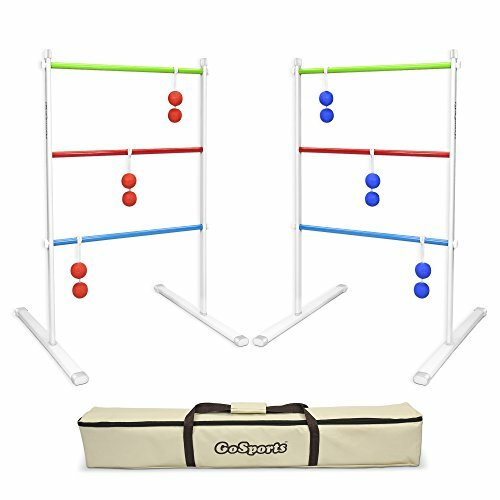 Perfect to take with you at parties, tailgates, or campsites; this ladder toss set can easily become the soul of the party, inviting everyone present to play and interact. Moreover, it comes with a company warranty and is backed by a 100% satisfaction guarantee. Last but not least, here’s a set able to satisfy the player shopping on a budget. This ladder game set brings all necessary to play right out of the box, and it won’t have huge damage on your wallet. Like all sets above, it includes two premium targets and six bolas. The color choice is amazing and surprising. Three of the bolas are green, while the others are orange. Although these are common colors in lawn game sets, they are quite unusual to find in a ladder ball set. The frames are made from durable PVC pipes. The bottom tubes come full of sand, enhancing stability on all terrains. Other accessories included are a durable carrying case as well as a set of rules and instructions dedicated to first-time players. The set is simple to assemble in just minutes and without any tools. Furthermore, we like that it comes with a 100% satisfaction guarantee. Coming at a great price and giving you the possibility of a risk-free purchase, this set is undoubtedly a great choice if you’re on a tighter budget. Many first-time players are wondering what the best ladderball set comprises. While there is no universal answer, there is a series of factors you should weigh in before buying. After all, the best ladder ball set is the one that fully serves your purpose. Ladders, also known as targets, are commonly made of either wood, metal, or PVC. Each material comes with different advantages, but the final choice will greatly influence the durability, weight, and safety of the product. Wood ladders: Are the most durable and reliable. Wood is a noble material that resists wear and tear surprisingly well as long as it’s maintained as instructed. Most wood ladders have metal bars, although it’s easy to find all-wood pieces as well. The main disadvantage of these ladders is their hefty price. Metal ladders: Are usually made of lightweight metal tubes, which are often powder-coated and treated to resist rust. These ladders are fairly durable, easy to assemble and provide a long-lasting solution, but they tend to be heavier than the PVC kind. PVC ladders: Represent the most inexpensive solution. These ladders are often used in game sets for kids, and the best budget sets also include PVC components. Price is their biggest advantage, but they are less resistant than metal and wood. When picking the material, remember that it greatly influences the frame’s reliability. If you want to play professionally, wood is undoubtedly your best choice. The other essential part of a ladder ball game is the bolas. In this case, too, you can choose between various materials and textures. Hard texture bolas: Are usually made from hard plastic and are very similar to golf balls. Their rugged texture improves aerodynamics and allows you to throw them faster. However, these balls represent a true hazard when kids are involved. Nonetheless, hard texture bolas are the only one you can use if you want to play by the rules. Soft texture bolas: Are made of rubber and are perfect for kids. These bolas are slightly soft and lighter than golf balls, increasing safety when playing with the youngsters. A feature often overlooked is the stability of your installation. Perhaps it seems unimportant, but the truth is that the bolas can hit the base with quite a force. Unless you don’t want to keep kicking it off each time you toss a ball, get a base that’s strong enough to keep your ladder upright. There are many solutions, from bases filled with sand to improve stability to those you can anchor in the ground. We’re fond of the first kind, thanks to their simplicity. All it takes it to set up your ladders and start playing, without worrying about anchoring pegs. For transport and storage purposes, most ladder ball sets on the market come dismantled and nestled into a carrying case. How fast you can set them up will have a great influence on the smooth running of the game, so pick a set that’s easy to install. All sets that have made it to our list are very easy to install and dismantle, so you can start playing in no time and pack everything and run in case a storm comes up out of nowhere. Last but not least, you must set a budget and stick to it. Ladderball sets come at varying rates determined by the quality of materials and design. Professional sets are the most expensive, but unless you’re truly serious about your game, perhaps you could make it with a cheaper alternative too. Regardless of the cost though, make sure to always weigh in the true value for money. To make it easier for you, all sets above bring high-quality features, and you can find the right choice either for weekend or professional playing. Determining what is the best ladder ball set for you takes much more than a simple scouring of the market. Some sets are suitable for the pros; others are more indicated for adults than kids. If you want to enjoy a game with your youngsters, investing in a set that’s kid-friendly is a must. Whichever your needs though, you now know which are some of your best picks. All you have to do is choose the set that best fits your budget and expectations, set it up, and start enjoying the summer.